Chicago does not have rent control. In 1997, the Illinois legislature passed – and Republican Governor Jim Edgar signed – SB 531 (the Rent Control Preemption Act), which prohibited local jurisdictions from passing it. At the time, no city in Illinois had rent control – but the real estate lobby had a national effort to quietly stop it in places before it starts. SB 531 passed with little fanfare: the State House voted for it 96-18, and the State Senate approved it 46-6. One of the six senators who voted “no” was Barack Obama – although many liberal Democrats voted with landlords and the Senate’s Republican majority. Obama’s vote – when one considers how few people stood up with him – is an example of his core progressive principles. While it’s valid to say that he should have done more to defeat it, consider that Obama was a freshman in a very hostile climate – and as a community organizer had learned to pick his battles. Illinois Senate Bill 531 was part of a larger national campaign in the 1990’s by the real estate lobby to defeat tenant protections. Efforts to weaken rent control in California (where Costa-Hawkins passed in 1995) and repeal it in Massachusetts (which the voters narrowly did in 1994) got the lion’s share of public attention. But a more quiet and effective tactic – which also encountered less opposition – was to pass “rent control preemption” in states where it did not exist. The Farm Bureau used a similar tactic in the 1970’s to push anti-farmworker legislation, and in some states it slipped by without the United Farm Workers (UFW) knowing it. Last month’s defeat of California’s Proposition 98 was a strong mandate for rent control – and the genesis of a renewed tenant movement. But when Los Angeles, San Francisco, Oakland, Berkeley and other cities have had rent control for years, it’s easier to mobilize renters against a landlord attack. Chicago did not have rent control when SB 531 passed – and besides a tenant’s rights ordinance passed in 1986 by Mayor Harold Washington, had few protections. When landlords pushed a bill to ban rent control in Springfield, Democratic legislators did not feel pressured to mount an opposition. 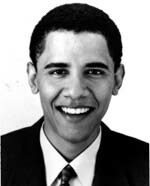 Enter Barack Obama, a freshman legislator in early 1997 from Chicago’s Hyde Park. At the time, the Illinois State Senate had a Republican majority – led by James “Pate” Philip of suburban DuPage County, a powerful figure who said that black people “do not have the work ethics that we have” and opposed raising welfare payments because “they’d probably just buy more lottery tickets.” Obama, who had literally just arrived in Springfield, had to vote on a real estate-funded bill sponsored by Tom Walsh – another DuPage County Republican and an ally of “Pate” Philip. It goes without saying that Obama did not have much power at the time to stop SB 531. He voted against it, but only five of his colleagues joined him. What’s disconcerting is how many liberal Democrats voted for it – including John Cullerton of Chicago’s Lincoln Park and Donne Trotter from Chicago’s South Side. It’s clear from the roll call vote that there wasn’t much pressure to oppose it, and the Democratic leadership at the time did not prioritize it as an issue. The fact that Obama was one of only six to vote “no” is an encouraging sign about his political convictions. Obama came to Springfield – and then Washington – with the mind of a community organizer, and it guided much of his early career. But like most seasoned organizers, he understood the art of the possible. Obama was not in the position at the time to defeat SB 531, which was effectively a done deal. Not only did Republicans control the State Senate, but there was no mobilized rent control constituency in Illinois to fight it. It’s a lot harder to motivate renters to protect a right they don’t yet have – than to save a right they have grown to depend on for their own livelihood. When Obama becomes President, it will be the job of affordable housing activists to work with his Administration and hold him accountable – and to help alter the political reality so that we don’t lose more battles like SB 351. For now, I’m just relieved that he wasn’t on the wrong side of that vote. EDITOR’S NOTE: Paul Hogarth was an elected Commissioner on the Berkeley Rent Stabilization Board from 2000-2004, and is now a tenant lawyer in San Francisco. He has volunteered on Barack Obama’s presidential campaign, and grew up in Chicago’s Hyde Park – where in the mid-1990’s he lived three doors down from Obama.